With a burly and muscular body structure, yet a mild and benign face, the American Bison reminds us to appreciate the distinct and unique findings in all of nature. American Bison (Bison bison) are colossal mammals of North America and symbolic of the Great Plains. The present regard for this species is a result of the recognition and appreciation given to it by the Native Americans. American Expedition is proud to present information, interesting bison facts & trivia, and photos of the American Bison. 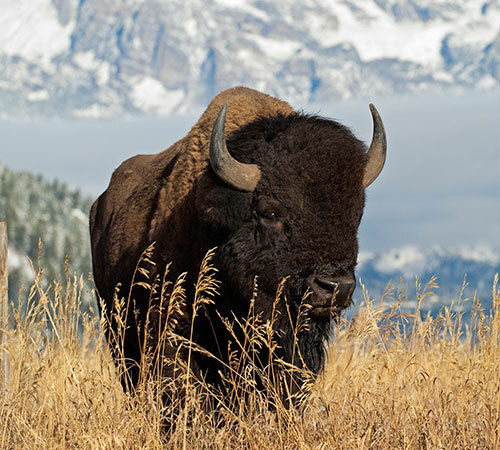 Bison (often referred to colloquially as buffalo) once roamed the plains throughout North America, but after settlers moved west, they were pushed to near extinction. In the 1800’s, the government paid hunters to kill bison because the bison would be in the way of the new railroad system. Today remaining herds can only be found on wildlife refuges and private ranches. American bison are very large mammals. In fact, they are the biggest on the continent of North America. Bison are commonly and erroneously referred to as buffalo, but it is important to know that they are only distantly related to each other. Male bison, known as “bulls,” weigh on average 1,200 to 1,400 pounds, but some can measure up to 2,200 pounds. Female bison, known as “cows,” weigh around 600 to 800 pounds. Bison may stand 5 to 6.5 feet tall, and can measure more than 10 feet in length. They are the largest member of the Bovine Family of animals in North America. 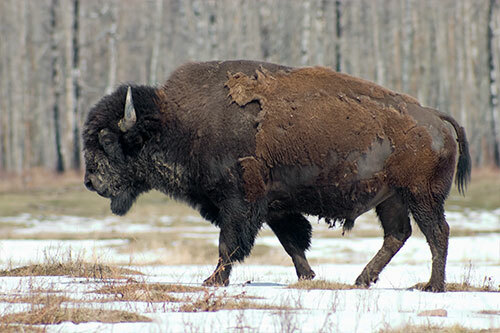 Although it has a very large build, the bison is capable of running at speeds of up to 40 miles an hour and broad jumping a distance of 8 feet from a standing start. Bison are well adapted to life on the prairie. They grow a thick, shaggy coat, of dark brown fur that provides excellent insulation during extreme northern winters. 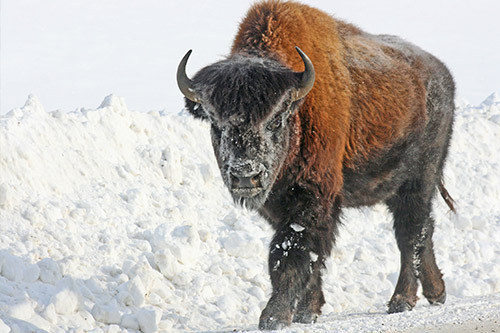 Their coat is well insulated; snow will accumulate on the bison's back without melting. To stay cool in the summer, bison will shed their hair in large clumps, making them look shaggy. They have large forequarters, and massive heads with short horns. They use their horns for protection against predators, and for fighting for rank within their herd. A hump is present between the bison’s shoulder blades. This hump is unique because it is comprised of muscle, not fat. This muscle helps to support its large head when grazing. Though bison are mild-mannered animals, they can be unpredictably aggressive at times. The sign an aggravated bison gives includes a snort, an arched tail, a wide open mouth, and a raised head. Breeding season, also known as “rut,” occurs during late summer and early fall. The only time the bulls enter into herd of females and younger males is during mating season. All other times, they live in small groups of up to thirty individuals bulls. Female bison are mature enough to begin producing calves at 3 years of age. Bison bulls are also mature enough to mate at this stage, but typically do not become dominant enough in the herd to begin breeding until they reach 5 years of age. The bull will fight for mating rights and then “tend” to the cow that he is pursuing. When a bull tends, he stays close to the cow waiting for a reaction from her. She will either become interested in him or walk away, not wanting him as a mate. The gestation period for bison is 285 days, after which a single reddish-brown calf is born. The cow and her calf will stay isolated for a few days, until they join the herd again. The calf will usually nurse from the mother for about a year, or until the next calf is born. The average bison lives 12 to 20 years. The term "buffalo" is a misnomer for the American bison, it is only distantly related to the Asian water buffalo and the African buffalo. The American bison is much closer related to the European bison. The bison’s hump is unique from other mammal’s humps (such as a camel) because it is comprised of muscle, not fat. 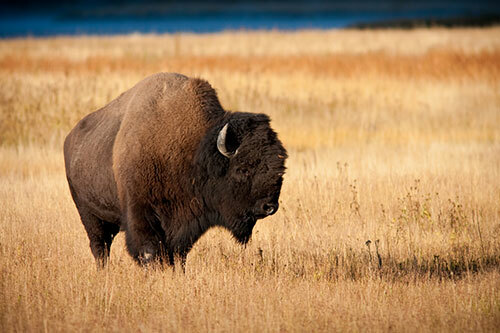 The bison is the largest living land animal that is native to North America. Bison are capable of running at a speed of up to 40 miles per hour. Bison live on average between 12 and 20 years. Bison mate during the fall months of August and September. 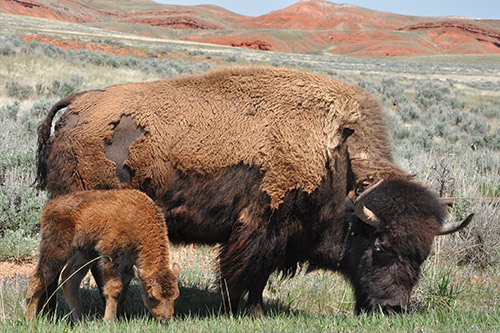 The gestation period for bison is 285 days, after which a single reddish-brown calf is born. The calf will nurse from the mother for about a year. Female bison, or "cows," are mature enough to begin producing calves at 3 years of age. Bison bulls are also mature enough to mate at this stage, but typically do not become dominant enough in the herd to begin breeding until they reach 5 years of age. Before horses were introduced into North America, Native Americans herded bison into large chutes made of rocks and branches, and were scared into stampeding over cliffs. These "buffalo jumps" provided hunters with a surplus of meat, which they could use in trade. Bison provided Native Americans with meat, leather, grease, sinew for bows, dung for fires, and their hooves could be boiled down for glue. If food was scarce, bison were sometimes consumed down to their marrow. Before 1600, the estimated population of American Bison was between 40 and 60 million. Bison were hunted to near extinction during the 19th century. Their numbers were less than a thousand in the mid-1880's. In addition to hunting, a long and intense drought hit the southern plains between 1845-1860. This caused a collapse of bison herds. 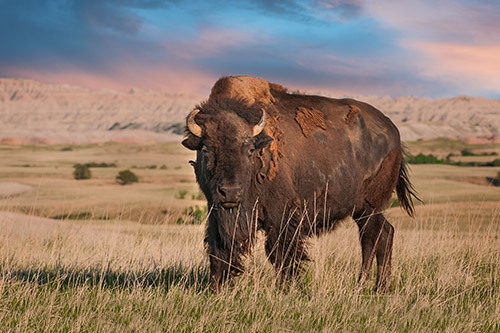 The American Bison underwent resurgence when James "Scotty" Philip began reintroducing the bison in South Dakota. Starting with a purchase of five bison in 1899, by the time of his death in 1911, the herd had grown to an estimated 1,000 head of bison. Today, the majority of bison live in domesticated herds. The last continuously wild bison herd in the United States lives within Yellowstone National Park. Between 2,000 and 3,500 bison are the remnant population of 23 individual bison that survived the mass slaughters of the 19th century. Predators include wolves, coyotes, and grizzly bears. 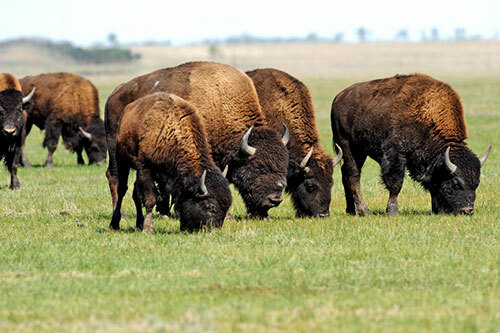 Prior to European arrival in North America, bison were never domesticated by Native Americans. 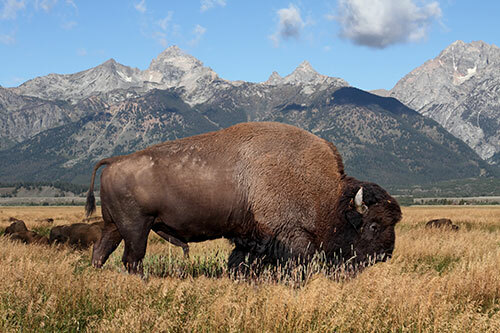 American bison live mostly on prairies and plains, but also in river valleys of North America. They enjoy large, open grasslands with plenty of vegetation. They are herbivores who graze on the prairie grasses and, at times, will also eat berries and lichen. Currently they are found in the United States and Canada on private farms and in National Parks. 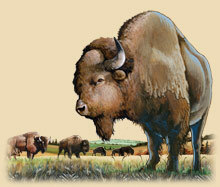 Shop for Bison gifts in our wildlife store. In the above video, Bison are shown in Yellowstone National Park. The last continuously wild bison herd in the United States lives within Yellowstone National Park. Bison are pack animals. Bulls live in seperate groups from females and immature bison, and join the herd during breeding season in the fall. Bison use their horns for protection against predators, and for fighting for rank within their herd. Bison once roamed the plains of North America, and had a population estimated to be between 40 and 60 million before European settlement. Today, there are an estimated 450,000 bison in North America. 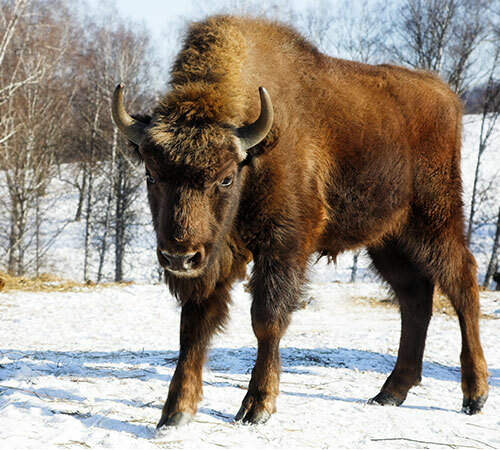 The bison's thick, shaggy coat provides excellent protection against extreme northern winters. 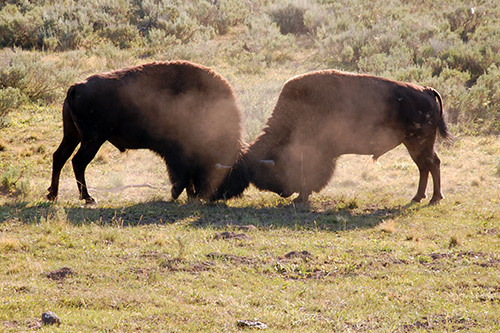 Occasionally bison bulls will fight for dominance in the herd. Snow will accumulate on the bison's back without melting - their coat is so well insulated that it traps all of their body heat. Bison will keep their calves close in order to offer them protection. Bison make excellent subjects for photography. They usually don't move very fast, and the dramatic western sunsets make excellent backdrops. 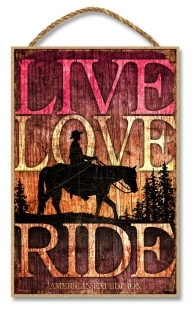 Interested in Bison Gifts & Decor? 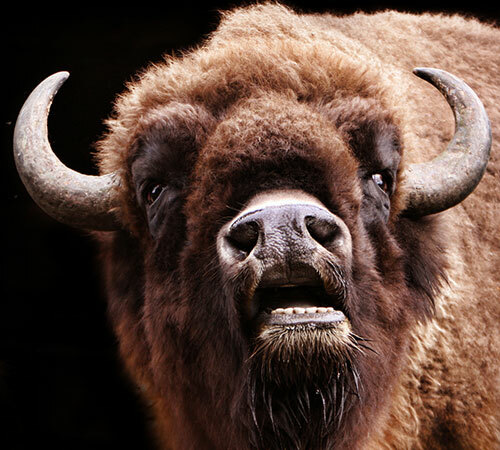 Visit the Bison section of our wildlife store!